I love a good underdog story. There’s something more genuine about the unexpected, more inspiring. Domestique Johan Vansummeren’s Paris Roubaix win, citizen runner Yuki Kawauchi’s performance at the 2011 Tokyo Marathon, pro triathlete Jeff Symond’s third place behind Craig Alexander and Chris Lieto at Ironman 70.3 Worlds last year... “I’m still not sure I’m not dreaming right now,” Symonds said in a post-race interview. Women’s sports are truly the underdogs of the underdogs, and bike racing is a prime example. Cycling is not a particularly high-profile sport in the U.S. – Lance Armstrong is its one well-known and controversial celebrity – but within this humble subset of professional and amateur competition, women’s cycling is even more obscure, if not downright invisible. 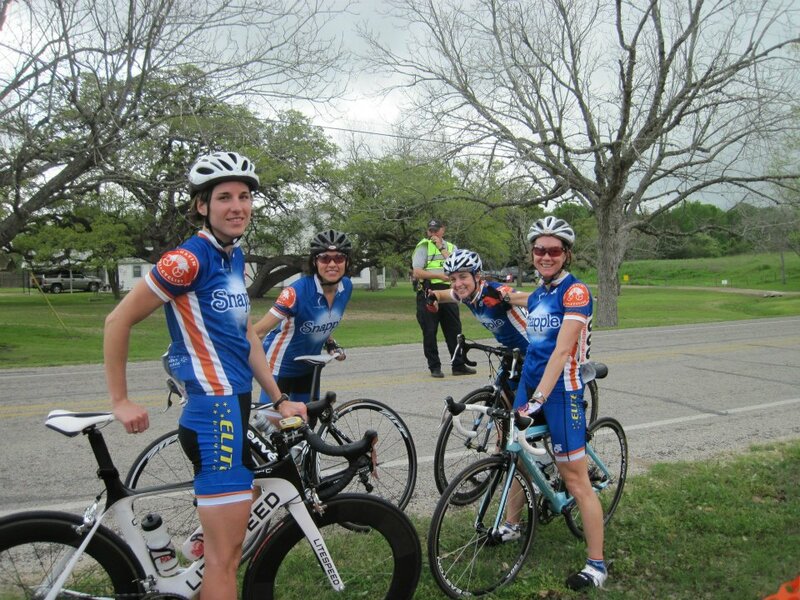 This year, however, women’s racing in Texas has elbowed its way deeper into the limelight. Most of the early season races have had large women’s fields, and several new, dedicated women’s teams have come onto the scene, including Snapple-ATC Racing and Bicycles Outback p/b Jubilee Mitsubishi. The Ghisallo Foundation is actively recruiting women new to bike racing by offering a trial program and discounted membership. Week after week, teams like Think Finance Racing, Team Seton Brain and Spine, Austin Flyers, Colavita, 787 Racing, Shama Cycles, Bike Barn, Kind Human Sports, and Velossimo are well represented in local women’s races. The FCS/Rouse elite women’s team, a powerhouse of Dallas-area and out-of-state riders, has been a dominating force at regional and national events. Last week, FCS/Rouse’s Kathryn Donovan placed fourth in the Redlands Bicycle Classic time trial on the heels of Megan Guarnier, Amber Neben, and Alison Powers. It’s an exciting time to be competing as a woman in Texas. Race attendance has slowly but steadily increased over the past three years, and from spring to fall, every weekend offers another opportunity to race a Texas Cup event. Pro and former pro riders like Shontelle Gauthier, Jen McRae, and Jen Purcell regularly compete at the Driveway Series and other area races. This weekend, the Come and Take It Omnium is attracting national pros with a practically unheard of payout equal to the pro men – $6,499 in total. Many of the best stories of women’s racing remain untold and uncelebrated, its heroes unsung. But if there’s one thing that the often unrewarded, overlooked underdog has claim to beyond the epic Eye-of- the-Tiger sports training montage, it’s purity of heart. Nowhere will you find a more lovely or genuine group of people, or a community so truly devoted to the love of cycling. I thought I trained hard in college and later, too, when I was competing in running and multisport events. Compared to this year, though, it was all just a leisurely stroll. I’ve never worked out so hard or so long in my life. Since my coach, Gray Skinner, began setting my workouts at the beginning of February, this year’s training regimen has taken the stuffing out of my legs, run it through a meat grinder, and then briefly put it back before beginning the cycle all over again. In addition to my aching muscles and new tunnel vision on cycling, this season has offered my first opportunity to race as part of a cycling team, and a very talented one. Snapple-ATC Racing is unique in that most of our riders don’t just compete in bike races, but also in triathlon and running events. As anyone who has ever attempted combining these sports knows well, the workload and race schedules involved often stretch a person quite thin. At the moment, I’m the only Snapple-ATCer who has given up her running shoes and gone full roadie. 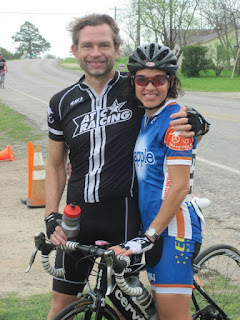 We’ve had two “team” races so far, La Primavera Lago Vista and the Fayetteville Stage Race, and are looking forward to competing in more events this summer. I started bike racing last year and am by no means the smartest rider in the peloton. Fortunately, I learn a little more with every race. Below are my personal and inexpert accounts of the events I attended this season. An informal, muy romantico five-person team trial hosted by Team Wooly Mammoth. Read Missy Ruthven’s Snapple-ATC report here. After a somewhat haphazard “off season,” I was extremely nervous about getting back to business. I raced only the second day of ToNB. Team Seton Brain and Spine’s Jenny Park had won the previous day’s crit, and Brain and Spine, with the largest team presence, was also favored to win the second day. Though the Women’s 3 and Women’s Open races were combined, it was a small field. Thankfully, everyone else’s legs, like mine, seemed to still be waking up from the long hibernation. Moving at a fairly slow pace, the pack stayed together until the “big” hill on the final lap, when Brain and Spine was suddenly off the back and 787’s Jenn Mix organized a paceline to maintain the gap. I didn’t look behind me to see what had happened, but I knew that whatever it was – mechanical, flat, or crash – everyone in the front pack had incentive to keep it away. We worked together until the final, cautious approach to the finish, where the sprint seemed to start from a dead stop with less than 100 meters to go. 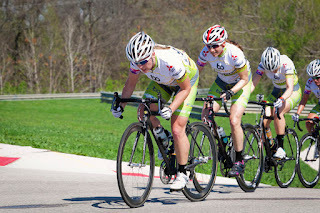 Velossimo’s Michelle Hayner and I were neck and neck in the sprint, literally screaming as we crossed the finish line. Michelle took first place, with me in second and Bicycle Heaven’s Shannon Gaffney in third. Two days of chilly, epic early season racing, with a first across the board for Snapple-ATC. Check out my full race report and Bicycle Outback’s very cool video compilation and race report. This was my first year to compete at Walburg and Pace Bend, legends of the Texas racing calendar. Apparently Walburg – “Wal-brrr-g” – is typically cold and rainy, but this year it sent Mineral Wells the clouds, leaving us with near perfect weather. The weekend fell in the middle of my first hefty block of training, and it taught me a few very important lessons about bike racing. First, a simple metaphor: You’ve only got so much power in the tank, and you have to decide what you’re going to do with it. You can, say, bake a half dozen 400-watt cookies or one 900-watt cake, but not both. At Walburg, FCS/Rouse's initial attack came in the first few miles, if not the first mile. Rachel Warner would take first place with something like a 10-minute lead. The phrase “gift-wrapped” came to mind, with absolutely no attempt to chase from the pack. It hurt my pride to see Rouse just walk away, and from there I didn’t so much have a strategy as an overwhelming sense of impatience. I didn’t know when to cut my losses, and as a solo rider, I made a race that was very easy for everyone else very hard for myself with short and futile attacks, to no conceivable benefit. When Katie Donovan soloed away for second in the final few miles of the race, I very much wanted to go with her, but could only watch in despair as she rode away. Important lesson No. 2 was imparted at the end: always know where the finish line is. It was a multiple-lap course, so I had no excuse. I burned the last of my matches catching the lead group, which started the sprint very early. Then they suddenly slowed toward the top of the hill, and I slowed behind them, thinking I was wrong about the finish and this was just the feed zone and lord help me who knows how far the finish line actually is... And of course they took off again because it was right there, Rouse just didn’t want to do a leadout for the competition, and now my legs were blocks of wood that simply wouldn’t move. Passed, passed, passed again, finishing in ninth place. Rouse took the podium, with Rachel Warner in first, Kathryn Donovan in second, and Lauren Stephens in third. Pace Bend taught me another series of important lessons, but this time not because I was learning from my mistakes, but mostly because I was tired enough that I was incapable of making my usual ones. When we rolled out at the line, all I could think was that I had no business being there and it was going to be an embarrassing day. I prayed to the fickle gods of bike racing, just this once, for a flat tire. But it was a good experience. With my legs aching, I had to sit in and I had to let other riders chase down attacks, and every ounce of leftover energy was spent in simple observation. The course was a one-way, six-mile loop largely closed to traffic, with no center-line rule. I think everyone expected FCS/Rouse, which at eight riders had the biggest and strongest team by far, to send out attacks until something stuck, and that’s exactly what they did. But at Pace Bend the pack responded very differently than at Walburg. Breaks rarely got far before they were reeled back in. Teammates were working for each other, and there were a couple of riders taking hard pulls at the front who hadn’t been at Walburg. Also, several riders attempted to bridge each time a break was established, which spurred the pack to move. At one point there was a very strong group of women up the road, and I thought, “Ah, that’s the one.” But they spent more time looking back than forward, and it was clear that something, or someone, wasn’t working. In the end, FCS/Rouse’s strategy succeeded, but I considered it an honorable and hard-won victory. This time there was no conciliatory gift-wrapping. Rouse had worn a lot of the main players down, and the final attack seemed well timed. Rachel Warner took first place with another solo break – this time, I’m proud to say for the rest of the pack, not by 10 minutes. I was careful to position myself near the front of the pack well before the last curve, and I gave absolutely everything I had to hang with the front group through the final stretch. In the field sprint that followed Rachel Warner to the line, FCS/Rouse’s Mary Maroon took second place, Brain and Spine’s Kim Ciolli took third, 787 Racing’s Jen McRae took fourth, and I crossed the line in fifth. I felt clever for maybe the first time. I finally understood the riders who refuse to touch the wind, no matter what happens in a race. It’s sometimes a gamble that pays off. Read Maggi Finley’s Snapple-ATC Women’s 4 race report from Pace Bend and Bicycle Outback’s Walburg and Pace Bend race report (with more video). La Primavera Lago Vista is two days of road racing on the same hilly 5.5-mile loop, clockwise on Saturday and counterclockwise on Sunday. Saturday’s race was Snapple-ATC’s first team event, with Marla Briley, Maggi Finley, Missy Ruthven, and myself on the roster. We had a great day, but it didn’t go anything like what I’d expected. The race started at a crawl. I’d had another hard week of training, and my legs were protesting with pins and needles, but they felt better whenever the pace began to pick up and even out. Bicycles Outback was making some early attacks, and I attempted one of my own. The pack wasn’t hesitating in the chase, shutting every break down quickly. On the back stretch, there was a long and steep downhill, and there the pack was flying. Every once in a while I would see one of my teammates come up on my left or right, but they were doing a good job of sitting in – I speak from experience when I say that this is a very difficult thing for a multisport athlete to do. On the prime lap, Maggi launched a successful attack, gapping the field, but Austin Flyer’s Shontelle Gauthier was on her wheel and came around just before the line to take the $100 prime. That hard effort right before the steep hill was just what was needed to split the pack apart, though. I broke away with a lead group of about four or five riders, and I thought that was it, that was going to be the race; we were working decently well together as a group and there seemed to be plenty of us. The pack was committed to bringing us back, however, and after a few laps, they seemed to have done it. Oddly enough, when it looked like they were breathing down on our necks, Sheri Rothe bridged up, the pack fell off again, and we were away for another lap or half lap. Our break was caught on the hill near the line by what was left of the pack, and here my teammate Missy Ruthven did the perfect thing by counterattacking at full throttle. I wanted to cheer. It was my first team experience of sitting in while I watched my teammate ride off into the sunset. A chase group formed moments later, which Maggi bridged up to, and I should have bridged up to. By the time I tried it, I was much too late, but I caught up to Maggi in No Man’s Land for some fun, if pointless, team TTing. Up ahead of us, the chase group had merged with Missy’s original three-woman breakaway. Missy, still worried about the main pack, spent a lot of time on the front in the last lap. She came in sixth in the sprint, and Maggi and I, the first stragglers across the line, were seventh and eighth. First place went to Shontelle, second to Team La’Sport’s Louise Smyth, and third to Bicycle Outback’s Sheri Rothe. Click here for Bicycle Outback’s race report. The Driveway Spring Classic was the kickoff event for the Driveway’s 32 weeks of Thursday night races, a chance to officially brush away the winter cobwebs. The 50-minute crit ran the full course clockwise and up the corkscrew. The previous day’s torrential rainstorms were nowhere in sight, and the weather was warm and clear. We had a field of 18 riders in the Women’s 1/2/3 race. I was in two small breaks – a prime shook up the pack for the first, and Team Brain and Spine initiated the second. Neither would last, but both stayed away just long enough for me to hope they might. Bicycles Outback did a very efficient and merciless job of returning us to the fold. On the last lap, in the final straightaway before the corkscrew, Bicycles Outback lined up at the front and put the hammer down. I was in the middle of the pack and my legs felt good; I still planned to go for it. I cranked it up to pass along the right side, but en route quickly thought, “Nope, nope, better stay right here.” I had moved forward, at least, and was now in a good spot for the field sprint. Except when we rode up the corkscrew I had my first experience with the candy-striped rumble strips on the right side. Pushed out by the rider to my left, I screamed, “Inside, inside!” before my inevitable teeth-rattling detour into terrain I had long feared. At last year’s Driveway races, especially when shorter daylight hours turned the Men’s 3/4 into the Men’s 3/4/5, I’d seen many riders forget on the final lap that the right side wasn’t smooth and try to squeeze through on the curb. The results were ungraceful, to say the least, but also sometimes fully acrobatic. When I was back on pavement, I didn’t have time to appreciate how I’d gotten there minus the obligatory somersaults. The sprint was already starting. I was in a fairly good position before the last curve, but Shontelle Gauthier finished ahead of me by approximately one light year. I took second, with SV/Bike Source Racing’s Kirsten Fee in third. Fayetteville was one of my first bike races last year, a humbling experience. (Click here for 2011’s race report.) The surroundings looked the same – there was the old dance hall, the line of porta potties, the cheerful jumble of bikes and people and cars in the parking lot – but everything else was different. This year, I had an idea of what to expect, and I was here with teammates. Everything was more laidback and fun, but I also knew that we had a legitimate shot at the win. In Saturday's 46-mile road race, the first lap was fairly slow. Then Colavita’s Suzy Snell soloed away, and the pack gave chase. At the KOM on the second lap, I was first up the hill in the quest for bonus time, followed by Sheri Rothe and Jenn Mix. Not long after, Kathleen Hattaway went all-in for a solo break, pulling away from us so far and so fast that I was worried she had it won, especially since no one in the pack was chasing. My teammates saved the day, and my legs. Leah worked hard to get the pack moving, launching several strong attacks. Missy took a blistering pull at the front, settling into time trial mode for what was probably two or three miles. It took a long time to bring Kathleen back into striking distance. Maybe it wasn’t the best strategy, but when Kathleen was close enough that I knew it would just take one final push to catch her, I figured the best way to get Missy back in the draft was if I took her place. But I must have surged – I’m often accused of this in pacelines – or having Missy and Bicycles Outback at the front kept anyone else from latching onto my wheel, because when I looked back at the top of the next hill, the pack was suddenly gone and Sheri Rothe was bridging up to join me. Sheri, Kathleen, and I worked together briefly. Kathleen had already put in a huge effort, and I was pushing the pace up the hills. She fell off just before 1K to go, and I knew this late in the game Sheri would have no reason to work with me so I didn’t bother wiggling my elbow. I just went as fast as I could, which was barely enough to beat her to the line. Kathleen held the pack off for third. We’d picked up the time bonuses for the top three finishers, and Sheri and I now also had about 30 seconds on the field. I was dreading that afternoon’s 8.9-mile time trial. In addition to the normal pressure of placing well and collecting time in the GC, I had a bet hanging over my head, compliments of my husband – it was ATC’s Don Ruthven versus me. Racing the Men’s 35+ 4/5, Don was finished long before my start, and he’d put in a good time. I hadn’t eaten much more than PopTarts and granola bars and was starting to feel both hungry and sick. My competitors made good-natured jokes in the start line. “BE NICE KAT HUNTER!” Kim Ciolli shouted as she rolled out. Time trials are my strength. The last four miles were soul-crushing, every bit as hard as people had said. It’s disheartening to be moving so slow when moments before you’d felt like Speedy Gonzales. Or when you most want to be done, to have the distance tick by like you’ll be there for all eternity, Rip Van Winkle frozen in the aero position with white knuckles and an awful grimace on his bearded face. I don’t think you’re really time trialing until you ask yourself whether death is preferable. Somehow or another I had gotten the idea that the course was about half a mile shorter than it actually was, so when the finish was still nowhere in sight at 8.5 miles, this was my biggest disappointment of the year thus far. But I made it, first place in the TT and yes, even fast enough to beat Don Ruthven. My teammate Missy took second in the TT, which put her third in GC and only four seconds behind Sheri Rothe in second. Marla was tenth in the TT, and Leah, on a borrowed TT bike for her first-ever experience racing in the aero bars, was 20th overall. She’d had a flat somewhere on the course but didn’t notice until she’d crossed the finish line, so we don’t even know how many hardman points to give her. Sunday’s road race, the final stage, was very dramatic. I had enough time on the field that I was safe with a pack finish, so I was planning to work for Missy like she’d worked for me the day before. During the first part of the race, Marla covered attacks and took a long pull at the front. Today I didn’t need the KOM time bonus but I didn’t want Missy’s competition to get it, so I took off at the bottom of the hill. Velossimo’s Michelle Hayner was with me for the fast ascent, third across the line, and Brain and Spine’s Nadia Barrera came around to the left to beat me to first. A few miles later, Sheri’s sudden flat was a boon for our team – if she didn’t finish with the pack, Missy would move up to second in GC. At first the pack was moving. A few breaks formed early after Sheri flatted, which kept the pack chasing. I figured it was a sure thing that she wouldn’t catch back on. But Sheri had her Bicycles Outback teammates to help her – Kathleen actually turned around when she found out what had happened. Leah wasn’t able to make it to Sunday’s race, and Marla had fallen off, so I didn’t have teammates to help me in the paceline. The pack was really struggling to work together. Karma was still in our favor when out of all the wheels in the wheel truck, Sheri was handed Marla’s particularly unsuitable spare. Sheri definitely gets extra credit for riding back up to the pack and finishing fourth in the field sprint on one 650c wheel. Always clever, Sheri rested a little before she made contact and then stayed out of sight tucked behind the last riders. She was probably already in when I was guilt-tripping the riders at the front – “A paceline is not that hard!” Negativity doesn’t work on me so I try to avoid using it myself, but my frustration was bubbling over. Very few people were working in the paceline, and riders who weren’t were still pulling to the front and then just getting in the way. After I saw Sheri’s long braid and knew that we’d squandered the opportunity that had fallen in our laps, I started racing not-so-smart. I wanted to keep the pace up to improve Missy’s chances in the sprint, so I sat on the front for a good portion of the last lap, but there was a headwind and I’m sure everyone behind me was still resting up nicely. At that point, the race was certain to be a field sprint, and I was planning to bide my time until we were closer in, but at probably about 400 or 500 meters to go Kathleen Hattaway took off. I followed her and when she peeled off, didn’t slow up. Everyone else moved over to the left once the sprint zone opened up, reading the wind. No one was in my draft, though, and I knew it would be pointless to try to correct my mistake that late in the game. I just went full speed ahead, still managing to make it first across the line. Brain and Spine’s Kim Ciolli was second and, unfortunately for Snapple-ATC, 787 Racing’s Jenn Mix was third, which moved her ahead of Missy in the GC. In addition to the third-place time bonus, Missy had lost time in the sprint, finishing about 10 seconds back from Jenn. But we were very happy with our team performance. Everyone on the team had worked hard to earn our first- and fourth-place standings in GC, and most importantly, we had worked together. In 2011, barely hanging onto the pack and a complete stranger to everyone there, I never would have imagined that a year later I would have so much fun. Click here for Bicycle Outback’s race video.